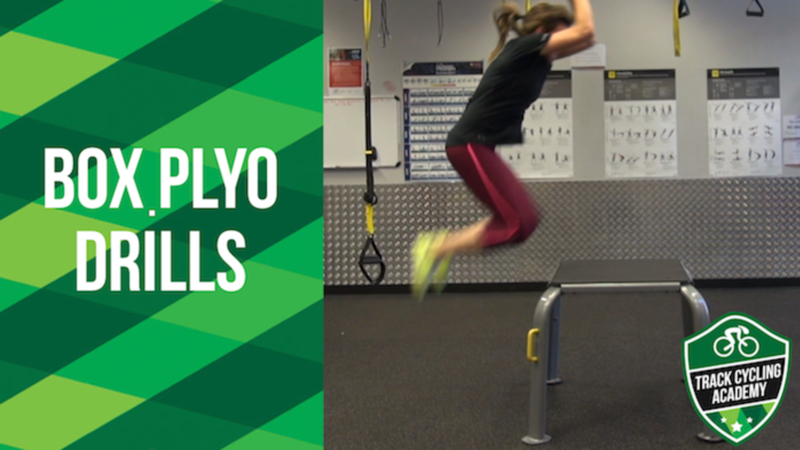 Olympian, Emily Rosemond takes you through a series of 5 Box Plyometric Drills. The muscular system is made up of both fast and slow twitch muscle fibers. The fast-twitch fibers are the largest, strongest muscle fibers in our body and they are trained through heavy lifting, anaerobic efforts, and explosive movements. This is contrary to their slow-twitch counterparts, which are typically geared towards endurance, and aren’t as high in absolute strength. Plyometric training focuses on increasing the strength and efficiency of our fast twitch muscle fibers. Translating this to the gym for your heavy lifts means greater recruitment of your muscles’ strongest fibers which results in speed and strength gains. Once these speed and strength gains have been established they will transfer to the bike giving you the ability to ride faster! Box Plyometric Drills are an advanced form of power training, and may take some time to coordinate and develop movements. We would recommend you complete stair and ladder drills before attempting these box plyo drills. As a safety precaution, we would recommend you wear shin guards, and only choose box heights that you feel confident jumping onto.